A recent Cityline set dressed by Yanic Simard/The Toronto Interior Design Group. Furnishings by Cocoon. Faux fur, candles and marble accessory by Indigo. Flowers by Martin's. Drapery by Ikea, customized by Drapica. Coveted design materials like gold and marble can be budget-busting in large quantities. However, you can introduce them in smaller doses via accessories and accents, and infuse your whole home with their sumptuous essence. For example, instead of a marble countertop, try using a short marble slab backsplash; a vase, tray or container; or marble knobs on cabinets. 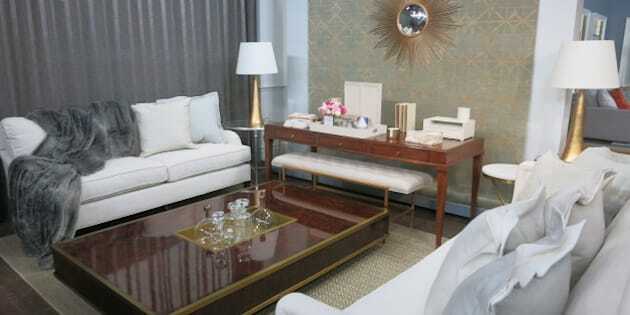 In a living room, introducing gold always adds a sense of glam, especially in more subtle burnished finishes that add a layer of sophistication (like the lamps in this set). Also try matte brass for a similar demure warmth--perfect for furniture legs or trim. Remember that repeating a material helps make it feel more integrated into the whole space; here gold also appears in the starburst mirror, the patterning in the rug, and even the edges of the books (displayed edge-out for a design twist). One of the cleanest, sharpest looks in decor is a crisp white wall or upholstery. If white seating isn't practical for your household, try a washable white paint finish, and use white linens to add as much breezy freshness as you can. A sense of crispness and order can naturally make any space feel more high-end, which means clutter has to go. This doesn't mean you can't include any decorative baubles, but you should ask yourself for each piece "do I love this enough to be worth dusting it?". If the answer is yes, it can stay. Otherwise, ditch it or store it away for a tidier look. Fresh flowers always say "photo-ready". Treat yourself to a few simple blossoms in a short vase to give any room a burst of life and sophistication. To up the style factor, apply a Chanel No5 sticker to a block vase (which you can print from home onto a sheet of sticker paper). Try This: Benjamin Moore's OC-55 Paper White (in washable matte) gives a cool contemporary look with just a hint of grown-up grey. 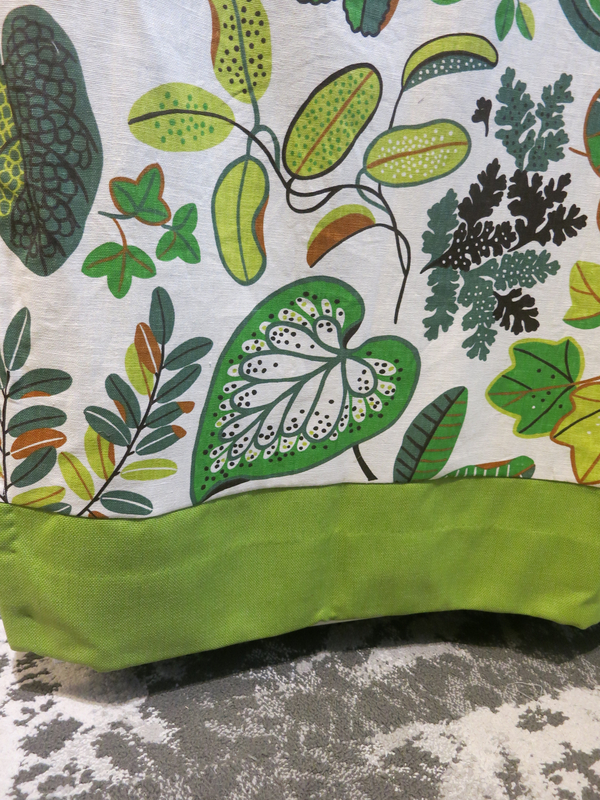 Drapery panel by Ikea, green colour-block detail added by Drapica. A well-thought-out lighting scheme always makes a room look its best. Don't rely on just one central lamp to fill in the entire space, but don't go overboard with a clutter of fixtures either. Try to include a balanced pair of table lamps, as well as a floor lamp or sconces (or both!) elsewhere in the room to spread the light around and prevent harsh shadows. Make sure at least some of your lighting is dimmable, so this filled-in scheme doesn't feel overloaded. During a renovation, consider putting multiple lights/outlets on one dimmer system, allowing you to set the mood for the entire room in a snap. Alternately, try a high-tech dimmable bulb or LED strip that can be remote-controlled via an app, and avoid the complex electrical work. Don't forget to invest in your biggest light fixture: your windows! Properly fitted drapery is key to a high-end look, whether you go fully custom or simply have a seamstress edit some prepackaged panels. To get panels to the perfect floor-to-ceiling size, try adding a strip of complimentary fabric to the bottom--it creates a smart colour-block look that will be unique to your home. Prints have their place, but to keep your decor personal, look to include at least one unique piece of statement art. Blow up photos at a print house, shop at local artists' fairs for undiscovered talents, or even try hanging a rug for old-world charm. Imagine how much an 8'x10' painting would cost in comparison! Creating a sense of luxury means appealing to more than just the eyes. The tactile senses affect how we take in a space, so make sure to include some rich textures such as velvets and furs. A faux-fur throw or sheepskin rug has a multitude of uses and goes a long way to adding luxe depth to your scheme. Speaking of the senses, don't forget your sense of scents! To keep your palette sophisticated, use a subtle, classic scent, such as a simple lavender candle, or a try a designer perfume formulation intended for home use, such as Jo Malone's linen sprays and diffusers. To get more design inspiration (and more peeks behind the scenes) follow me on Twitter and Instagram via @yanicsimard, and visit tidg.ca.